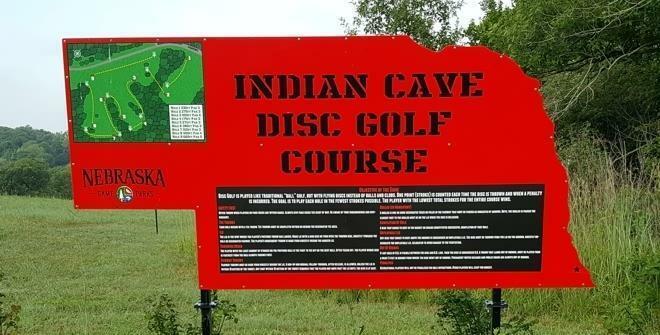 The course welcome sign and map at Indian Cave Disc Golf Course in Shubert, Nebraska. Another travel day today, making my way from Shenandoah, Iowa to Kansas City, Missouri. 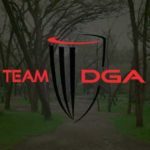 I used the opportunity to play three new courses that have opened in the past few years, since I had previously played every course available in Southeastern Nebraska and Northeastern Kansas. As well as three additional courses in Kansas and Missouri. I started my day by playing a course whose description honestly made me a little nervous. Indian Cave Disc Golf Course in Shubert, Nebraska. Descriptions of the course that I had read prior to playing it mentioned 7-8 foot wide fairways and tall rough on either side of said fairways. However, apart from Hole 2? The course’s bark was much worse than its bite. A fun course! And all that “tall rough” on either side of the fairways? 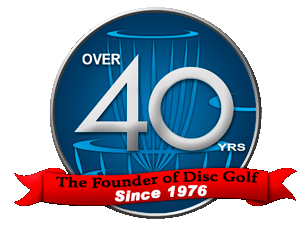 Not even up to my calves, making locating discs that missed the fairway an easy experience. So all my visions of wasting hours searching for lost discs on that course ended up being much ado about nothing. After Indian Cave, it was off to Stella, Nebraska, to play a tiny three-hole course. I think it literally took me about five minutes from the time I got out of my car, took four pictures, and threw three deuces before I was back in the car and on to Hiawatha, Kansas! To play a course I was told was closed the last time I was traveling in the area. The course was certainly open today, so I enjoyed crossing another new course in Kansas off my list. And then it was on to Jackson Park in Atchinson, Kansas to play its 9 and 18 hole courses for the first time. View from the Hole 18 tee at Jackson Park in Atchinson, Kansas. The nine-hole course was fairly average, typical. But I really enjoyed the 18-hole course. 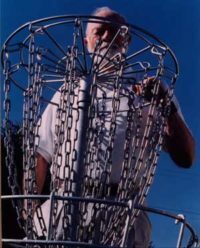 I didn’t play the course particularly well (-5 51 on a par 56 course), but it reminded me a lot of the first course I ever played with baskets: Riverside Park in St. Cloud, Minnesota. 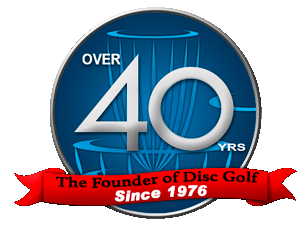 And after playing one more nine-hole course (Riverview Park in Platte City, Missouri) before heading to the Kansas City airport to pick up one of our Disc Golf Foundation board members, I managed to add six new courses to my course collection by the end of the day. I won’t get as many courses played in the next few days, with DGF Board meetings to attend. But it feels good to already have 16 new courses played on this trip.